This one is super simple my friends. I do really enjoy a sweet root vegetable soup, but in culinary school the first thing we ever made was a roasted carrot soup and I got sick of it realllyyy fast. You see, we made it again and again and again until we perfected every single technique involved. I’m talking from prepping and cutting, to roasting, to soup making, to final texture. It was delicious, but it was meant to be a crash course and it was a lot. of. carrot. soup. So I must admit I don’t tend to make these kinds of sweet creamy soups at home very much as a result. However, one day recently I was browsing through The Bravo Family Cookbook, which is just a collection of family favorite recipes developed or sourced over time, and this simple soup happened to catch my eye. I love sharing simple recipes with you, so when I saw that this one has about 3 steps and a handful of ingredients I knew I had to make it. Turns out I loved the consistency and sweetness. It’s just the right soup for a cool winter day when you’re craving a silky texture and a sweet and salty, gulpy/slurpy, warming meal! The original author isn’t cited unfortunately, so I do apologize for that missing credit! I decided to make mine with a butternut squash that I already had laying around. I cut it in half, removed the seeds, and steamed it in about 1” of water in a baking dish at 400 degrees. It probably cooked about 30 minutes, but I knew it was done when I could easily poke the exterior with a fork, and the skin was wrinkled. I then scooped it out and mashed it up! Another option would be to peel and chop pumpkin or whatever root vegetable you decide to use, then bake it on a baking dish at 400 degrees with a little olive oil and salt. Mash with a masher or a fork. 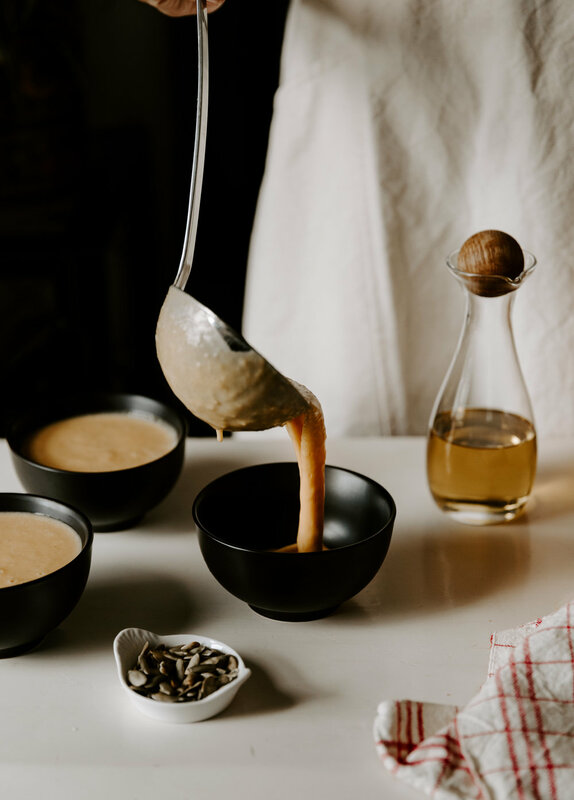 Keep in mind that depending on the vegetable you use or your method for mashing, you may want to give your soup a run through the blender or use a hand held (immersion) blender to get a nice creamy, silky texture in your soup. I ended up doing this and added it as a step to the recipe because I wanted a silky texture without onion chunks. I find that it can get very sweet, very quickly. You may want to try the soup before you add the brown sugar, or add a little more salt at the end of everything if you feel it needs balance. This soup would pair excellently with a three-cheese grilled cheese sandwich or a yummy veggie salad. Or maybe even freshly made fontina cheese croutons! Brown chopped onion in butter over medium heat in a heavy bottom pot, such as a dutch oven. Add all ingredients and mix well. Bring to a boil and down to a simmer. Taste and add more salt if needed. Blend soup in a blender or with a stick blender to remove the onion chunks. Serve with roasted pumpkin seeds and a drizzle of olive oil.